The popular George Town Festival in Penang has grabbed media attention for controversy surrounding two portraits of LGBT activists. The portraits of two activists, Nisha Ayub and Pang Khee Teik, were pulled from a photo exhibitions called “Stripes and Strokes” by photographer Mooreyameen Mohamad. 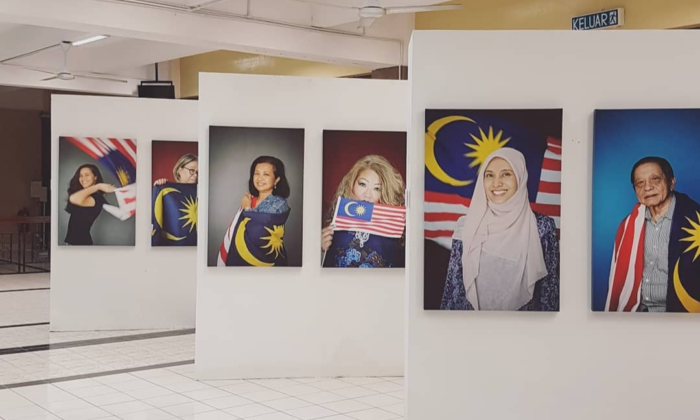 Their photos were part of a collection of portraits of everyday Malaysians, which also includes Malaysian politician Lim Kit Siang and activist Siti Kasim. The George Town Festival is a yearly month-long arts and culture extravaganza taking place in Penang, and it celebrates the rich heritage and history of George Town. The inaugural George Town Festival event first took place in July 2010, and was held in honour of the city’s UNESCO World Heritage Status. Singapore Tourism Board, Sime Darby Yayasan, Eastern Oriental Hotel, Khazanah Nasional and others. Since the incident, both Ayub and Pang have also addressed the matter online. One of the activists, Ayub, clarified that the portraits was only meant to show her love for the country. Both Pang and Ayub also disclosed that they had both received threatening and cyber-bullying messages online regarding the portraits. However, the posts by the duo received support from the online community for addressing the matter. The jam-packed festival has over one hundred acts, performances, exhibitions and installations and majority of them are free and open to the public. This year the festival will take place on 4 August – 2 September. According to The Star, a sponsor for the exhibition, Datuk Vinod Sekhar, has also spoken out against the decision to remove the portraits. In the report, he said he expected more from the Penang government and added that instead what should be done was enlightening people and changing their mindsets. Following the furor, Datuk Mujahid Yusof Rawa, a minister from the Prime Minister’s office in Malaysia, has disclosed that he was the one who asked for the portraits to be removed. This was because both Ayub and Pang were promoting LGBT activities, which he said was “not in line” with the Pakatan Harapan government’s policies, The Star reported. This is not the first time in the region an event has caused a stir surrounding LGBT issues. In Singapore, a 2017 Pink Dot out of home promotional poster ran into controversy after it sparked police reports from netizens against the controversial LGBTQ event in Singapore. The event also saw the Advertising Standards Authority of Singapore weighing in and asking for the tagline on the poster to be amended. Ford launches targeted campaign to appeal to 30-something audiences using QR codes, celebrity endorsements, digital and social med..